The Moon's monthly cycle of phases are undoubtedly one of the most conspicuous changes in the night sky. At new moon, our planet's only natural satellite is entirely unobservable, on two counts. It presents an almost entirely unilluminated disk and at the same time it also lies very close to the Sun in the sky. At full moon, meanwhile, it is visible for most of the night, often bright enough to render any deep-sky observing totally impossible. The Moon's changing appearance over the course of each month arises because of its orbit around the Earth. The Moon circles around the Earth once every 27.3 days, in a plane which is almost but not quite aligned with that of the Earth's orbit around the Sun. The two planes are separated by about 5.1°. At all times, the half of the Moon which is turned to face the Sun is illuminated. But as the Moon circles around the Earth, it is seen from different angles from the Earth. 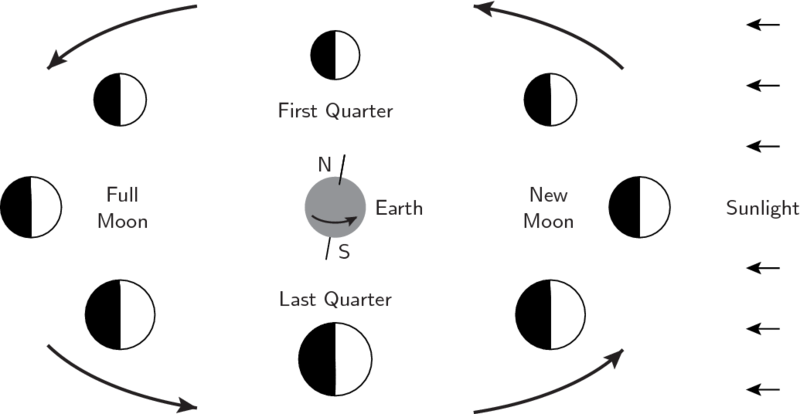 At new moon, the Sun, Moon and Earth lie in a line which is almost exactly straight, with the Moon in the middle. The illuminated side of the Moon is almost the exact opposite to that which faces the Earth, meaning that the Moon's disk appears almost entirely unilluminated from the Earth. Conversely, at full moon the three bodies form a line once again, but this time with the Earth in the middle. The Sun's rays illuminate the Moon from almost directly behind the Earth, lighting almost exactly the same half of the Moon's surface as is turned towards the Earth. Over the course of each month, the Moon drifts gradually eastward across the sky relative to the Sun, rising and setting around an hour later each day. Eventually, having made a complete circuit around the celestial sphere, it comes back to where it began. In the two weeks following each new moon, the Moon is visible in the afternoon and early evening. Each day, it remains visible for gradually longer periods in the post-sunset evening sky. It grows from an initially thin crescent, through half phase after one week – at first quarter – to become gibbous. It eventually reaches full moon after two weeks. When full, the Moon lies almost directly opposite the Sun in the sky, rising as the Sun sets and setting as the Sun rises. As a result, it is visible for almost the whole night. Over the following two weeks the Moon continues its eastward journey, now getting closer to the Sun again and approaching it from the west. As it does so, it rises an hour later in the evening each day, until eventually it is only visible in the early morning and pre-dawn sky. It becomes increasingly visible in broad daylight in the morning sky. The period of the Moon's phases does not quite match the period of its orbit around the Earth. The Moon circles the Earth once every 27.3 days – each sidereal month – but its phases repeat every 29.5 days – each synodic month. The difference arises because the Earth itself moves around the Sun by a distance of around thirty degrees each month. Conversely the Sun appears from the Earth to have moved by thirty degrees along the ecliptic in that time. As a result, it's not enough for the Moon to complete one full revolution around the sky to get from one new moon to the next. The Sun has moved across the sky in the intervening month, and the Moon has an additional 30° to travel in order to catch up with it. It takes the Moon an additional two days to travel this extra distance and catch up with the Sun. Only then can the cycle repeat.